Group C and Group D will wrap up pool play on Tuesday starting with Peru-Australia and France-Denmark in the early slot, followed by Argentina-Nigeria and Croatia-Iceland in the afternoon. 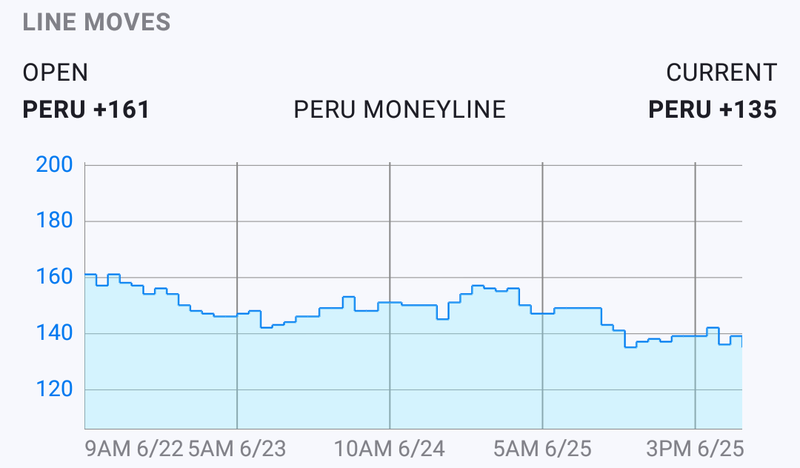 Peru (55% of bets) are getting the majority of support as the slight favorites to notch their first win, and the bookmakers have slashed their odds from +161 to +135 over the last several days. Even though Los Incas have yet to score, the game total (2.5) indicates they’re likely grab at least one. They’ve already been eliminated but could spoil any hopes of Australia advancing, and will want to leave the World Cup on a positive note. Even though Denmark and the draw were attracting the majority of tickets in the early betting, the line has shaded toward France in this one. Still, they’re not the odds-on favorites and are currently being offered at +117 despite an overwhelming 71% of moneyline bets. A draw would be good enough for France to win Group C, but that could still line up Argentina as their opponent in the Round of 16. Croatia, Nigeria and Iceland are all still in play as well for Les Bleus. If you’re going contrarian in this game, Denmark +0.5 would be the best option. The total is at just 2 goals, and bettors are having no problem taking the over. It was a monster day for contrarian bettors on Monday as none of the heavy favorites (Portugal, Spain, Egypt) was able to get a win. On Tuesday, we’ve seen the public shift gears, as Nigeria (+547) are getting more than half the moneyline tickets to beat Argentina (-183). Of course the South Americans looked terrible last match, but they have a chance to turn things around and forget about the past. Can Argentina Flip the Switch Against Nigeria? This is one of the few times you’ll see a big favorite getting such low support. Sharp money has also been moving the odds toward Argentina, another good sign if you fancy backing the under-performers. Croatia are in great shape to win the group even with a loss to Iceland, and they’ll likely shuffle the starting lineup to avoid injuries and suspensions. Accordingly, their odds moved from +145 to +115 over the weekend. Public bettors don’t seem to mind as the Croatians have garnered nearly 80% of support. They’ve looked incredible the first couple matches and have no pressure in the final game, but a win isn’t a must. The obviously contrarian play here would be to take Iceland +0.5 (-137) if you want to fade the masses.